The Scottish capital has so much on offer from historical sights to impressive landscapes and shopping. It is well serviced by an international airport that has regular flights throughout the day from airports in England. Flight times from London are under an hour so Edinburgh is a perfect getaway for a short trip or couples weekend retreat. The Georgian streets are a delight to walk down and Edinburgh’s position next to the North Sea gives it a unique backdrop. If you are looking for an easy to access city break then look no further than historic Edinburgh. 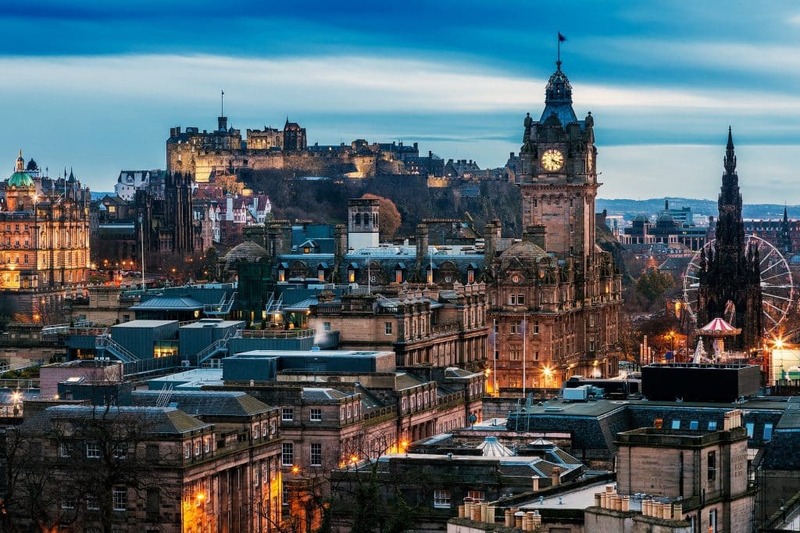 This breaks.com guide to an Edinburgh city break will help you understand why tourists visit Auld Reekie time and time again. If you are looking for Edinburgh airport car parking, you can get the best deals and choice from the official airport site. You can find the best priced flights to and from Edinburgh here. You have probably heard of the Royal Mile of Edinburgh and it is something that should be on your city break to do list. As the name suggests, the path is a mile long and has a castle at each end of the stretch. On the street itself you can take in as many or as few shops that line the cobbled mile as you wish. There are lots of guided tours on offer if you wish to learn more about this historic part of Edinburgh. Edinburgh is home to J.K. Rowling, creator of Harry Potter, and you can see much of the inspiration for the book in the city. This article will help you do a self-guided Harry Potter tour that takes in sights such as the school that inspired Hogwarts. Harry Potter fans can also go on organised tours to get a more in-depth look at the magical city that is Edinburgh. The legend of Greyfriars Bobby lives on and you can visit the statue placed in his honour at Greyfriars Kirkyard. If you want to know more about why this dog got his own statue that has since become a tourist attraction then read more here. It is highly recommended to take in Edinburgh castle even if just from the outside. Positioned at one end of the Royal Mile, you can combine it with taking in that street and are rewarded with a view across the whole of the city. A great picture opportunity and also a chance to get some perspective on the complex structure of this beautiful city. The Fringe Festival that takes place every year during the month of August and attracts 450,000 annually. To give some context to the scale of the event, over 3,000 shows and 50,000 performances take place in just one month. In the run up to the Edinburgh Festival, review websites and newspapers produce the guides of what to see (and what to avoid) to help you build an itinerary. The Edinburgh Tattoo attracts an audience of over 100 million people globally who tune in to watch as a musical extravaganza takes place. The Red Arrows take part alongside military regiments from around the world show off their musical skills. It’s not easy to get a ticket so book early if this is on your Edinburgh city break agenda. Before you go to Edinburgh, check out EdinBraw which is a super site run by two locals (@EdinBlogger and @EdinBloggette) that will help you make the most of your city trip. Use the Edinburgh city break hotel search box above to get some great hotel deals. We have also highlighted 3 places to stay that are worth a look when planning your stay in Edinburgh. Radisson Blu Hotel, Edinburgh. The Radisson Blu chain are a mark of quality and that is no different with this particular hotel. As part of your stay you can get exclusive access to the Melrose and Healthclub which is ideal if you are looking to unwind. Located on the Royal Mile, it has an envious position and puts you at the heart of Old Town near all the major sights. Get a discount on the Radisson Blue Hotel in Edinburgh here. Apex Grassmarket Hotel. Also positioned in Old Town, the Grassmarket Hotel in Edinburgh is loved by guests who point out the wonderful views, close proximity to the heart of Edinburgh and the superb pool facilities as reasons they recommend this hotel. If this sounds like a hotel you would like to check in to then compare prices and save money instantly by checking live prices here. Ibis Edinburgh Central Royal Mile Hunter Square. If you are looking for prime location without the hefty price tag then this simple, modern hotel could fit the bill. The Ibis in Edinburgh is on the Royal Mile and puts you in the best part of the city! You can see the best prices on the market for the Edinburgh Ibis hotel here. There is more to Scottish cuisine than deep fried Mars bars and haggis! However, if that’s where you would like to start your culinary journey then head to the Clam Shell on the Royal Mile to get your hands on an artery blocking deep fried Mars bar. To get your fill of haggis and experience authentic, fresh Scottish food then head to A Room in the West and enjoy what they have to offer. Vegetarians rejoice! The renowned David Bann vegetarian restaurant in Edinburgh provides a tasty contrast to too-often bland vegetarian fare. Reasonably priced but quality food will not disappoint vegetarians or meat-eaters and deserves a visit while in Edinburgh. There are plenty of drinking options to suit all tastes in Edinburgh. Whisky drinkers will be in heaven while those who enjoy craft beer are in the home of one of the most well-known brands of recent years: BrewDog. You can visit BrewDogs own bar to taste both their own-brand selection as well as a expertly-picked beers from other breweries. With over 120 Scotch whiskys on offer, fans of the drink should make their way to The Abbey Bar which is situated near the meadows. Expert bartenders will guide you through the extensive menu and you may even be able to class your evening of drinking as educational! Find out more about an Edinburgh city break with our Edinburgh hotel deals, flight discounts and tips.